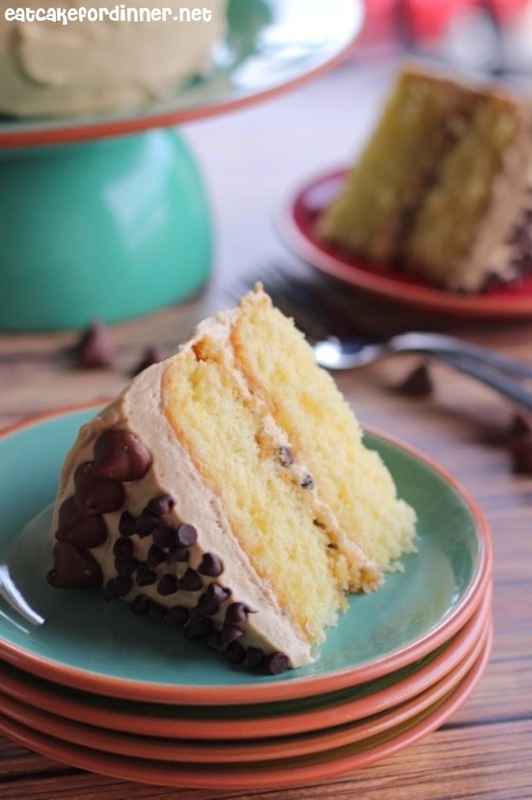 I have never eaten actual classic Tiramisu, but I have made this Tiramisu Cake a few times and I love it. I only make this on special occasions. It's not hard to make, but there are several steps involved. I think this might even be the longest recipe I have ever typed :) Don't let that scare you though, because it really is easy and worth all the steps. The frosting tastes like coffee ice cream, there is a perfect frosting to cake ratio, it has the perfect amount of sweetness and it has just a slight coffee aftertaste. The cake is tender and moist and it does not get soggy. I like it best served a little cold. I typed the recipe as written, but I noted a few things that I adjusted. Since I know I will get comments about using instant coffee instead of espresso powder, make sure you use what you prefer. I don't mind the flavor of instant coffee and since I usually have that on hand, that is what I used. This recipe does work if you cut it in half and bake in smaller pans. 1 1/4 sticks (10 Tbl.) unsalted butter, room temp. Preheat oven to 350 degrees. Grease, flour and line with parchment paper two 9x2-inch round cake pans. For the Cake: Sift together the cake flour, baking powder, baking soda and salt; set aside. Using a stand mixer with the paddle attachment or a hand mixer in a large bowl, beat the butter on medium speed until soft and creamy. Add the sugar and beat for another 3 minutes. Add the eggs, one at a time, beating well after each addition. Add the egg yolk and beat for one minute. Beat in the vanilla. Don't be concerned if the mixture looks curdled. Reduce the mixer speed to low and add the dry ingredients alternately with the buttermilk, adding the dry ingredients in 3 additions and the milk in 2 (begin and end with the dry ingredients); scrape down the sides of the bowl as needed and mix only until just combined. Divide the batter evenly between the two pans and smooth the tops with a rubber spatula. Bake for 28-30 minutes or until a toothpick inserted in the center comes out clean, rotating the pans at the halfway point. Transfer the cakes to a rack and cool in pans for about 10 minutes, then run a knife around the sides of the cakes and invert them to a wire rack and cool completely. To Make the Extract: Stir the espresso powder and boiling water together in a small cup until blended; set aside. To Make the Syrup: Stir the water and sugar together in a small saucepan and bring just to a boil. Pour the syrup into a small heatproof bowl and stir in 1 Tablespoon of the espresso extract and the liqueur or brandy; set aside. To Make the Filling and Frosting: Put the mascarpone, sugar, vanilla and liqueur in a large bowl and whisk just until blended and smooth. In a separate large bowl, using a stand mixer or hand mixer, whip the heavy cream until it holds firm peaks. Switch to a rubber spatula and stir about one quarter of the whipped cream into the mascarpone mixture. Carefully fold in the rest of the whipped cream. To Assemble the Cake: If the tops of the cake layers have crowned, use a long serrated knife and a gentle sawing motion to even them. Place one layer right side up on a cardboard round or a cake plate. Using a pastry brush or small spoon, soak the layer with about one third of the espresso syrup. Smooth some of the mascarpone cream over the layer (about 1 1/4 cups) and gently press the mini chocolate chips into the filling. Put the second cake layer on the counter and soak the top of it with half of the remaining espresso syrup, then turn the layer over and position it, soaked side down, over the filling. Soak the top of the cake with the remaining syrup. Whisk 1 - 1 1/2 Tablespoons of the remaining espresso extract into the remaining mascarpone filling (this will now be the frosting). Taste the frosting as you go to decide how much extract you want to add. If the frosting looks as if it might be a little too soft to spread over the cake, press a piece of plastic wrap against its surface and refrigerate it for 15 minutes or so. Refrigerate the cake too. 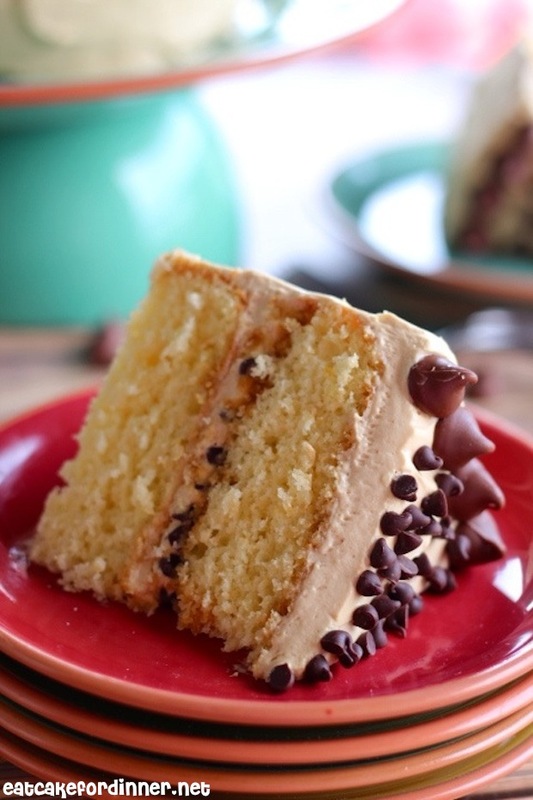 With a long metal icing spatula, smooth the frosting around the sides of the cake and over the top. 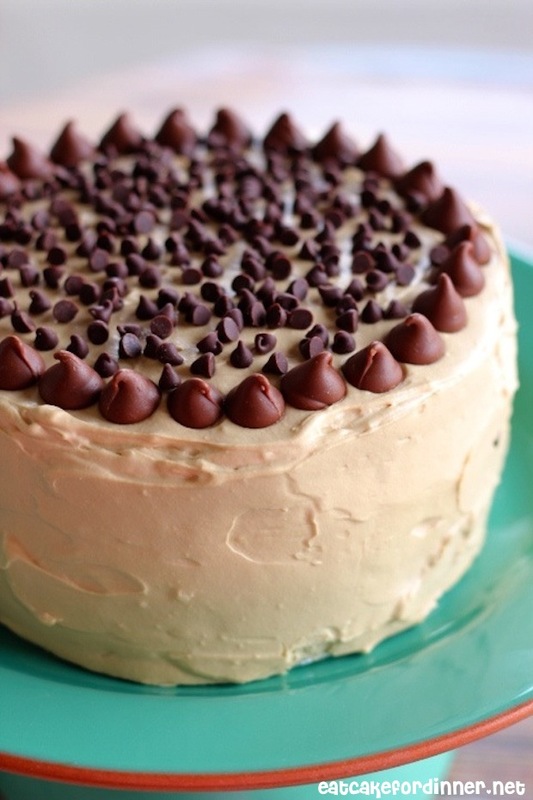 If you want to decorate the cake with the chocolate chips or espresso beans, press them into the frosting. Refrigerate the cake for at least 3 hours before serving. The elements need time to meld. Jenn's Notes: This recipe does work when cut in half. I use two small glass dishes and reduce the oven temp to 325 degrees. I bake my cakes for 28 minutes.